The types & causes of ankle instability? Most commonly this starts after an ankle sprain in an ankle that has been previously stable. Just because the ankle starts to give way ( or feels like it might) does not necessarily mean however that the ligaments themselves are now lax. It is possible that the ligaments may be mechanically normal but the ankle never the less feels unstable to the patient. This is called functional instability (and the ankle joint cannot be demonstrated to be unstable by examination). The causes are various and include synovitis ( inflammed tissue) inside the joint causing the ankle to “catch” in certain positions or flaps of bone and cartilage post-injury having the same effect. Poor function of the muscles and sensory feedback around the ankle following injury can also have the same effect. Mechanical instability is less common than functional instability and if present it means the stabilising ligaments & structures are no longer are up to the job. This is diagnosed by comparing how well the ligaments hold the ankle in various positions when it is stressed during examination. Such laxity can sometimes only be detected when a person is anaesthetised , especially if they have good muscle tone or examination of the ligaments is painful. Shown below is what’s known as a “varus stress test” which demonstrates in this person laxity of the CFL (calcaneo-fibular ligament). Mechanical instability can also occur without injury .This is seen in patients with general ligament laxity issues and patients with poor neurological function .Below is a patient with one such neurological condition ,CMT disease. The lateral instability that occurs with such a condition is treated with bony fusion surgery (but this is a rare occurrence). In most people the initial management should be conservative. If the instability has resulted from a recent & severe sprain then the management is determined by this acute soft tissue injury (see ankle sprain section). Irrespective of the time following injury a course of strengthening and balance based physiotherapy rehabilitation should be tried in most people. This will require at least one supervised session of physio per week and a daily repeating of the strengthening and balance excercises. An ankle brace or high-topped boot can also be of use to minimise symptoms during this phase. If following 6-12 weeks or so of conservative treatment the ankle is symptomatic then an MRI is required. In most cases symptomatic means the ankle has remained both painful & unstable. On occasion the instability will have been treated by the physio strengthening of the muscle groups around the ankle but the joint remains painful. The MRI is predominantly used to identify potential sources of pain. The purpose of the MRI is to identify chondral & osteochondral damage (including arthritic changes) within the ankle , associated tendon pathologies (such as peroneal tendon tears), the presence of posterior impingement (see sprained ankle section) and associated subtalar pathology. If a patient has suffered an inversion type injury which has started the instability (which the majority will have) then the MRI of the lateral ligaments will be almost always abnormal with respect to the lateral ligaments. The key point in determining the need for a ligament reconstruction (in a patient with ankle instability) is not whether the MRI signal from the ligaments is abnormal. The key point is whether the ligaments are lax when they are loaded and strained and this is a dynamic test performed by examining the ankle. 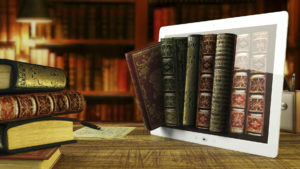 What if instabilty is left untreated ? It is a bad idea to continue to go over on the ankle in the long term (even if only an occasional occurrence) rather than in some way stabilise the joint. Every time uncontrolled high force passes through the joint the chance of damage to the joint lining increases. Over the long term this can predispose to the development of ankle arthritis. How the ankle is stabilised (physio rehabilitation , removable ankle brace or surgery) is probably not relevant as long as it ceases to be symptomatic and give way. If an ankle is mechanically unstable and has failed conservative treatment operative treatment should be considered. On occasion it is not possible to know for sure prior to an examination under anaesthetic that the ligaments will require reconstruction. A not uncommon clinical scenario is that an ankle remains both painful and unstable after initial treatment with equivocal findings when examining the ligaments. Following MRI scan of the ankle the operative plan would then be an arthroscopy (key hole surgery to treat sources of pain within the ankle joint) combined with an examination of the ligaments whilst under anaesthetic (the most accurate way to see if the ligaments are mechanically lax) and a reconstruction of the ligaments at the same sitting. 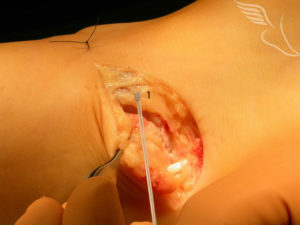 There are many different techniques described to reconstruct the ligaments but one of the commonest is to use the local soft tissue to tighten up the lateral side of the joint. 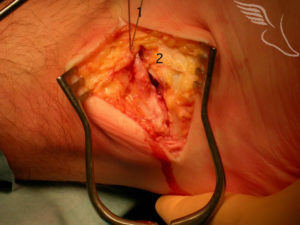 This picture shows at the front of the ankle one of the portals (1) that has been used for the arthroscopy. The skin incision sits in a curved natural skin crease so that ultimately it blends with the skin lines and can be almost undetectable. It runs from close to the outer portal (1) , beneath the tip of the fibula (2) to the peroneal tendons (3) that sit behind the Fibula. The deep layer of fascia and ligament sits beneath the fat . Once identified above and below the joint this layer is divided in the same line as the skin incision .A Kevlar suture is then “locked” into the lower flap of deep tissue (1). The lower flap (2) is then pulled up beneath the upper flap(1) by a fair distance , producing a double layer of deep tissue .Usually 4 or 5 such sutures are placed before being tied tightly , thus stabilising the lateral side of the ankle. The image below shows all the sutures tied off in preparation for the skin closure. Surgery is followed by an overnight stay in most cases. The first 4 weeks are spent in short post-operative cast , non-weight bearing The first 2 weeks of this are in a back-slab Dressing change and suture removal is at 2 weeks By 4 weeks patients go into a into a stabilised ankle brace and commence full weight bear as soon as able (which takes a few days to a week only) Physiotherapy commences one full weight bearing has been achieved , working on in-line ankle range of movement and strengthening , progressing to balance and proprioceptive rehabilitation, including peroneal strengthening. My own recommendation is that no specific mobilisations ( active or passive) are used on the subtalar joint into inversion. Circumducting the ankle also does risk over-stressing the repair at an early stage. Adequate Subtalar movement will be regained during functional rehabilitation phase. Functional rehabilitation requires a static bike from 5 weeks , Cross-training from 7-8weeks and light -jogging on a tread mill likely to commence sometime after 10 weeks. Other than the bike the other activities will be initially using the ankle brace. The initial return to sport is likely to require an appropriate brace for the first month. Revision Lateral Ankle Ligament Reconstruction I am writing to you as an extremely satisfied customer. I recently attended the Foot and Ankle Clinic for a left ankle lateral ligament reconstruction procedure. After 31 years of continual abuse of my limbs playing rugby football and other sporting activities, my left ankle had become completely unstable to the point that when walking down any stairs or even a pathway kerb, my ankle would collapse underneath me, often leaving me in an embarassing heap. After my initial consultation I was offered a date for surgery extremely quickly, an additional surgery date being setup for the May Day Bank Holiday. On arrival at the Priory Hospital staff were knowledgeable, courteous and helpful which immediately removed any feeling of apprehension I may have had at the time of arrival. Later on in the morning of admission I received a further briefing from the surgeon about the surgical procedure which again left me feeling completely at ease and relaxed, fully understanding the procedure and proposed rehabilitation requirements. After the surgery I had a debrief explaining how things had gone and was informed about the detailed program of recovery and subsequent physiotherapy required. I returned to the Priory Hospital approximately 6 weeks later to have my cast removed and an examination of my ankle. I had suffered what I had considered to be a massive muscle wastage on my left calf which I was assured was normal due to the inactive period in cast. The prognosis of surgery and initial recovery was very positive and immediately I began a series of physiotherapy appointments. I was amazed how quickly strength, mobility and especially stability returned to my ankle. I underwent different exercises to develp muscles and increase the range of ankle movement. Within a matter of weeks I had regained full use of my ankle to a level I had not experienced for years prior to the procedure. I would fully endorse the procedure to anyone in a similar position to myself and would be more than willing to act as a reference for anyone having any reservations about ankle ligament reconstruction surgery at the Foot and Ankle Clinic.